This carriage, together with two other Dreadnought carriages, represents the pinnacle of the Metropolitan Railway's coaching stock. In the late 19th century, the Metropolitan Railway was pushing northwest from London towards Aylesbury and beyond. It eventually met up with the Manchester, Sheffield and Lincolnshire Railway (forerunner of the Great Central Railway), itself pushing south. The beautiful coaches of the GCR shamed the Metropolitan Railway into producing these Dreadnought coaches. Nearly one hundred Dreadnoughts were built between 1910 and 1923. Special features which can be found on them are the unusually wide footboards and the curved tops to the doors, reducing the risk of damage if accidentally opened in tunnels. This type of carriage would have been in daily use on the Metropolitan Railway services through Quainton to Verney Junction. This type of carriage survived until electrification reached Amersham in September 1961, allowing replacement of this locomotive-hauled stock by electric multiple-unit trains. London Transport then stored six carriages at Upminster, Essex until needed in May 1963 for the Underground Centenary celebrations. The three Metropolitan Railway carriages owned by the Vintage Carriages Trust were all initially purchased privately by Mr David Kitton from London Transport for the then-proposed Westerham Valley Railway preservation project. When this scheme failed, the carriages were loaned to the Worth Valley Railway in July 1965 and two of them formed part of this railway's re-opening train in 1968. After extensive use in the earlier years of the railway the Vintage Carriages Trust purchased all three carriages from Mr Kitton in 1974. 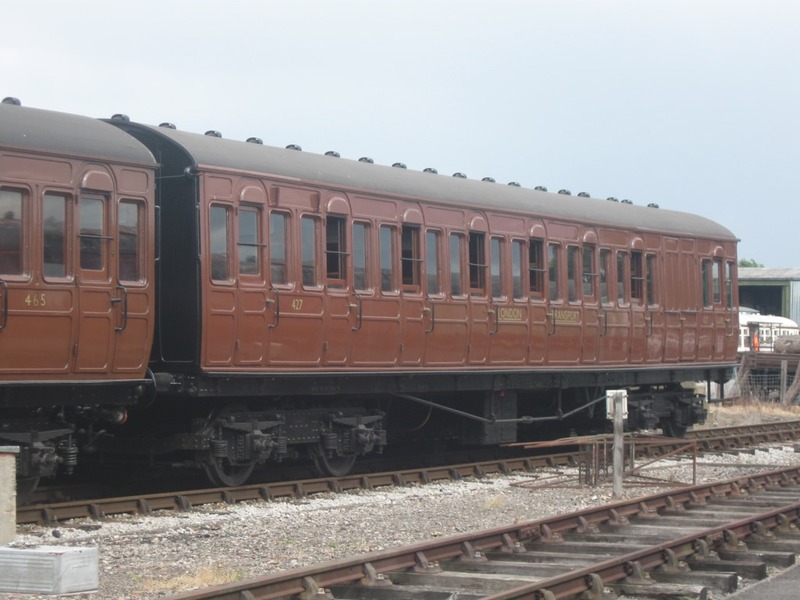 Following painstaking research, this carriage was repainted during 1997 to another, much lighter, shade of London Transport brown known as Leaf Brown (BS381C-489) and the end of the Brake Compartment was painted Rail Red (BS381C-593). The Brake compartment itself is now resplendent in its authentic "Cerulean Blue". Ongoing "compartment by compartment" restoration continues for this carriage. In March 2008 this carriage was repainted in the Blue and Primrose livery which it carried in 1968 when it was used on the Keighley and Worth Valley Railway's re-opening train. It was displayed alongside locomotive no. 30072 which was also repainted into its 1968 Worth Valley re-opening livery. In January 2009 the carriage was repainted into the London Transport dark brown livery. This carriage visited the National Railway Museum, York, in February 2006, February 2007, February 2008 and February 2009. It has since toured as part of the Metropolitan 150 celebrations, including the Epping Ongar Railway as well as Quainton. These carriages are occasionally used on the Keighley and Worth Valley Railway as a Vintage Train set. The Trust has also embarked on a programme of cleaning, checking and making good where necessary the bogies and underframes of all three of the Metropolitan carriages. Although these are the only extant Dreadnought carriages, other Metropolitan Railway vehicles have survived. Some of these can be found on the Bluebell Railway. This carriage visited Quainton for a short stay as part of the Metropolitan 150 celebrations in 2013. It appeared in a pure Metropolitan Railway train with Metropolitan No. 1, Metropolitan Railway First Jubilee 353 and Dreadnought Metropolitan Railway Nine Compartment Third No. 465.